George Graham Reviews Neco Novellas' "New Dawn/Ku Khata"
Perhaps one of the most appealing aspects of the contemporary world music scene is the way disparate influences can come together in enjoyable and often surprising ways. It's also fun to discover a geographical music scene one had not previously heard, especially one that provides one of those interesting stylistic fusions. This week we have a worthwhile example, a recording by an artist from Mozambique, by way of the Netherlands: Neco Novellas, and his recording called New Dawn / Ku Khata. Though Mozambique is a large country in East Africa, which borders on South Africa, which has long had a thriving music scene, not a lot had come to these shores from Mozambique. It was a Portuguese Colony, so the official language is Portugese, like Brazil, and so there are some parallels between the two. It's also near Madagascar, an island nation with a thriving and unique music scene, so one can also hear some of that influence. And since English is widely spoken in Mozambique, the CD also has some lyrics in English, though it's definitely a multi-lingual recording. Neco Novellas, the stage name for Anselmo Joao Johanhane, grew up in a musical family among the Chopi ethnic group. His father played guitar and keyboards, and his mother was active in church music, blending traditional African folk music into Catholic services. Neco's siblings are also musical, and two brothers and two sisters appear with him on the CD. The sound they come up with is a creative, yet somehow familiar-sounding mix of Southern African, Brazilian, Latin American, some American pop, and a few stylistic curves. There is surprisingly little percussion, and most of the sound is based on an amplified acoustic guitar, along with Novellas' distinctive vocals, which can range from plaintive African to laid-back bossa-nova style. Novellas is heard on the acoustic guitars, vocals and some percussion. His siblings include include electric guitarist Nelson Novela, bassist and sometimes guitarist Isildo Novela, along with Cidelia and Isabel Novela on the backing vocals. Also appearing as a guest is vocalist Lilian Vieira from the band Zuco 103, who is originally from Brazil, speaking a different dialect of Portugese from that of Mozambique. But there are also lyrics in some of the other languages of the region including Chopi, Xangana and Runga. Fortunately, there are Einglish translations provided in the CD booklet. Most of the words are somewhat philosophical and generally positive. 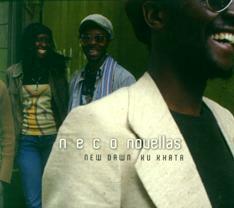 Neco Novellas' CD New Dawn / Ku Khata is an engaging and quite enjoyable blend of influences from an artist whose country, Mozambique, has not been represented much on the world music scene that has reached the US. The CD brings together influences familiar to fans of World Music and Afropop, but the combination is a fresh-sounding one with the Portuguese heritage of Mozambique drawing parallels to Brazilian music, and its acoustic guitar-based sound and dearth of extra percussion providing another distinctive twist. Neco Novellas and his siblings form a naturally tight band that keeps its coherence through the various musical experiments they undertake, almost of which are artistically successful. For our sound quality grade, we'll give the CD an "A-minus." The mix well captures the music's sonic diversity, but like too many pop CDs these days, the sound was compressed which watered down the music's dynamics and rendered almost everything blandly at the same volume. With its diversity of influences, it's hard to pin down Neco Novellas' new CD and that's what makes it such a find for world music fans, such as the many of us who have not had a chance to hear much Mozambiquan music previously. It's definitely a worthwhile recording.